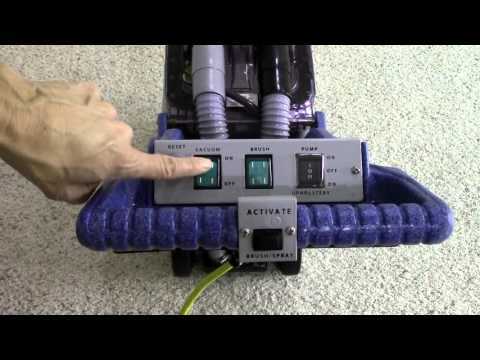 A small, self-contained unit with powerful brush agitation to clean carpets, hard floors & grouted tile. Weighs only 40 lbs, light enough for anyone to handle. Compact body design and fold-down handle make it a breeze to transport and store. Remove two screws and the machine opens like a clamshell for fast service. Small enough to clean tight spaces and corners yet powerful enough to perform well in any commercial setting. Patented self-adjusting, self-leveling brush and vacuum shoe for easy cleaning of all carpet lengths and uneven floors plus longer brush life. Upright-mounted motor and intercooler system combine for long-lasting operation. Solution/Liftoff Recovery Tanks: 3 gal./3 gal.